For the last two weeks or so, I’ve had several e-mails from people who don’t know what the hell they’re going to feed their vegetarian friend or family member this Thanksgiving. Most of those letters have come from worried mamas who don’t want to see their vegan daughters eating a salad while everyone else is fist-deep into the feast, but they don’t feel right about just serving them Tofurkey, either. So, for the next few Mondays, I’m going to focus on warm, scrumptious, meatless meals that would be just right for your holiday table – and that any vegetarian would be happy to put away like a trash can. The first recipe is this Pueblo Corn Pie from Nava Atlas’ new book, “Vegan Holiday Kitchen.” It might seem like an odd Thanksgiving choice at first, but it’s adapted from a Native American recipe, so it’s only right that it would find a place on the Thanksgiving table. 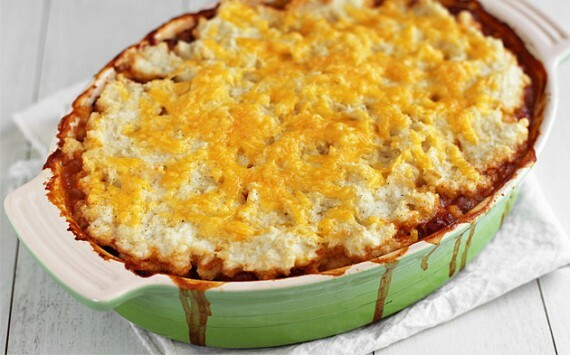 The “pie” is actually a casserole with layers of perfectly seasoned bean chili, Cheddar cheese (nondairy for vegans) and cooked cornmeal that gets nice and crusty on top. So, your fork breaks through that crunchy cornmeal layer, through the gooey cheese and then down into a chili filled with pintos, corn, tomatoes, bell pepper and onion. It’s warm, filling and really delicious, especially served warm with a nice cold dollop of sour cream (nondairy for my vegan friends). Mamas, you can relax. I’ve got your backs. P.S. Nava Atlas’ “Vegan Holiday Kitchen” will be available Nov. 1. I received an early copy last week, and if you’re a vegan (or feeding one), you should definitely check it out. The recipes are geared for holidays year-round (including Jewish holidays), and the photos are gorgeous. Heat the oil in a large skillet. Add the onion, and cook over medium heat until translucent. Add the garlic and bell pepper, and continue to cook until the onion is golden brown. Add corn, beans, tomatoes, and seasonings. Stir well, and simmer for 10 to 15 minutes. Season to taste with salt. Remove from the heat. Bring 5 cups of water to a rolling boil in a heavy saucepan or round Dutch oven. Slowly pour the cornmeal into the water in a thin, steady stream, whisking continuously to avoid lumps. Add the salt, and cook over low heat, covered for 20 minutes, stirring occasionally. Oil a shallow 1 1/2-quart baking dish, and line the bottom with half the cooked cornmeal. Pour the skillet mixture in, and gently pat it in evenly. Sprinkle with the cheese (if using). Top with the remaining cornmeal. Bake for 45 to 50 minutes, or until the cornmeal is golden brown and crusty. Let stand for 10 minutes, then cut into squares to serve.